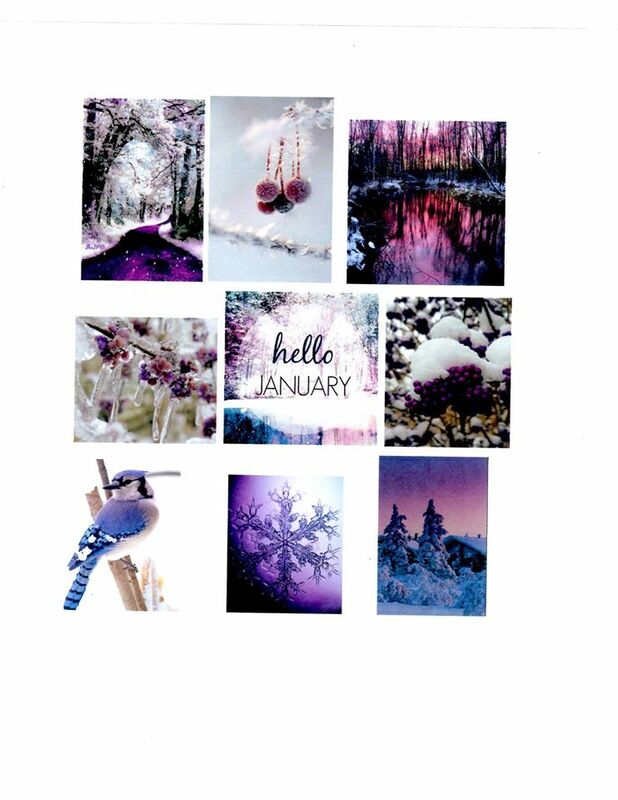 Here we are almost at the end of January! I'm beginning to think ahead to Valentine's day. I know you have probably been bombarded with Valentine goodies at every store you go to. I just love looking at all of the pretty things, even if I don't tend to decorate for it. My mom was always so good at decorating for every holiday, I don't think I inherited that particular gene. But I do make a mean Valentine's Day card! Today's project features one of the newer digi's at Craftin Desert Divas, in fact there were a couple different digi's recently added featuring Cupid. The one I'm using is Cupid in Clouds. Sometimes I don't get to sit down and make my projects all at once. In fact, sometimes my creativity only flows in bits and pieces at a time. So this project was made over a several day span. 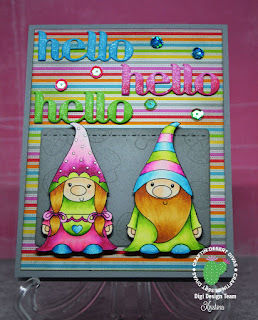 I started by embossing a piece of watercolor paper with one of my heart embossing folders in my stash. Then I had to decide what colors to use. I wasn't sure which ones I wanted as I didn't really have a plan in my head yet. I figured using a variety of pinks was probably a pretty safe bet for a Valentine's card. I pulled out three different distress inks. Spun Sugar, Worn Lipstick and Picked Raspberry. I put clean water down on the paper and then randomly added bits of the different colors. I set it with my heat tool and when back over it with a second layer of colors. I then spritzed it with some water and dabbed it off with a paper towel to make some lighter areas. I let it sit overnight and came back to it. This time I decided to add some more contrast. I splattered a bunch of black paint first. Then I added silver splatters. Another round of drying overnight. So the next chance I had to sit down I had to figure out where I was gong next. I'd like to say that I always have these awesome ideas in my head. Well, it's not exactly true. If you struggle with your creativity don't worry about it. We all deal with it at least now and then! I decided to pick up the Cupid digi that I had printed out a few nights before. I dug around in my copic collection and pulled out a handful of colors that I felt coordinated nicely with the background. Pinks on her shirt and the heart arrow and purple hair! For the wings I picked out three very light shades and sort of dabbed them on. No real blending. I went over it with irresistible Pico Embellisher in the Shimmer color. Nothing says wings more than a bit of shimmer! I cut her out using the smallest die from the Fancy Frames die set. I hand cut a black layer and adhered it to the Cupid layer. The watercolored back ground I cut down by hand as well and adhered it to a black card base. I put foam tape on the back of the cupid piece and glued it down. I had a few scraps left of the watercolored background. They were just big enough to use the heart dies from the Pocket Pieces Hi die set. I went over them with my Wink of Stella. Can never have enough sparkle! I randomly glued them down. I also added wink of stella to the swirls on the cloud portion of the digi. The very last thing I did was to add the XOXO sentiment from the Simply Said set. Whew! And at last my project was complete. I am very happy with how she turned out and I hope you like her too! Happy Monday everyone! I'm trying to start the week off on a super positive note. It certainly helps that I got to spend some time playing in my craft room this weekend! I hope you had a chance to craft a little bit too. I am back to share another project for the Jess Crafts Digitals Design Team. I am having a lot of fun coloring up Jess's super adorable stamps. Have you had a chance to take a look at her Etsy shop? You can find it here: Jess Crafts Shop. The stamp I am using today is from Monster Mash. Isn't this monster just so adorable??? And with the variety of sentiments that Jess includes with the set, he can be used for many different occasions. He happens to coordinate very nicely with the monsters on my paper. The paper is from Doodlebug and is part of the Monster Mania collection. I'm not sure if it's still available but I have been hording it in my stash. I'm so happy I finally found the perfect image to use with it! I colored my little one-eyed cutie using my copic markers. I used BG02, BG05 and BG07. I simply *had* to add glossy accents to the eye. I hand cut him out and went around the edges with a black marker. I used foam tape to pop him up on the white layer. The white layer is cut out using a die from MFT Stamps. I sponged around the edges with a little teal ink and adhered it to the gray layer. I also inked around the edges of the gray piece. 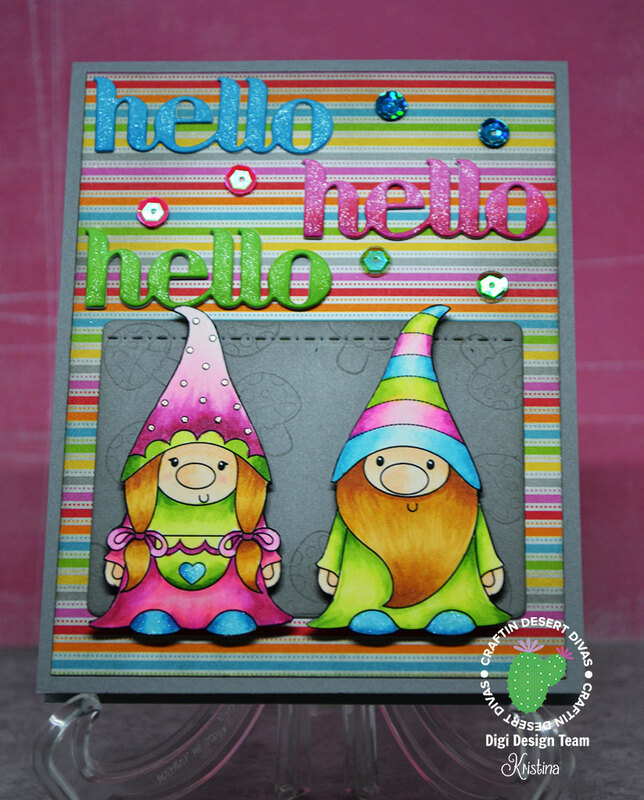 The green polka dot piece comes from a petite prints pad also from Doodlebug. Patterned pieces were glued on to a teal piece. I went around the edges with a little sandpaper to give it some texture. This was all adhered to piece of gray cardstock and finally onto a white card base. The final step I was really excited about was that I used my Minc to apply a pretty teal foil to my sentiment! Yes, I may have even been a little giddy about how pretty it was when I pulled off the cover sheet! Hello my crafty friends! I decided it was time for a brightly colored card. It's been pretty dreary around here and I needed something to brighten up my day! When Tara released these cute little gnomes (Winter Juliet & Winter Gnomeo) I knew I was going to have to make something with them. I have started collecting gnome things for my yard and stamps as I find them. Craftin Desert Diva has SO many fabulous dies and sequins in addition to all the stamps. If you haven't browsed through those sections you really should give them a look! Lately I have been selecting a piece of patterned paper and letting it guide me in my choice of colors. It's almost like participating in my own color challenge! I used Copic markers to color in the gnomes. I had orginally intended to just cut a white panel with the gnomes on it but the RV's bleed something crazy. Plus I really had to saturate the colors in order to get a blend. Let's just say the RV's and I aren't friends right now. I digress. The simpliest solution was to just cut them out by hand. No worries. The gray rectangle was cut out using the index card die from the Pocket Pieces Hello dies. I thought it needed a little something so I used the little mushroom stamp from Autumn Wishes as well as sponging around the edges with gray. I pulled some cardstock out of my stash to coordinate with the striped paper to cut out the hellos. I also cut several out of white cardstock. The blue got one layer of white, the pink got two and the green got three. I stuck the colored hellos back in to one of the negatives to hold it in place. I pulled out my copics and started blending up from the bottom. I love the way they turned out. Of course, I also had to use Spectrum Noir sparkle marker on top. I just can't seem to help myself! Once all of my pieces were ready I started adhering everything together. Striped paper was glued directly to the gray card base. Small gray piece glued to the striped paper. Gnomes went on top with foam tape since I wanted them to stand out. I then lined up the hellos and glued them down. I dug around in my stash of CDD sequins and found some perfect matches. Easy peasy! Oh, I also added a little sparkle to the heart on Juliet and to the dots on her hat. Hi guys! 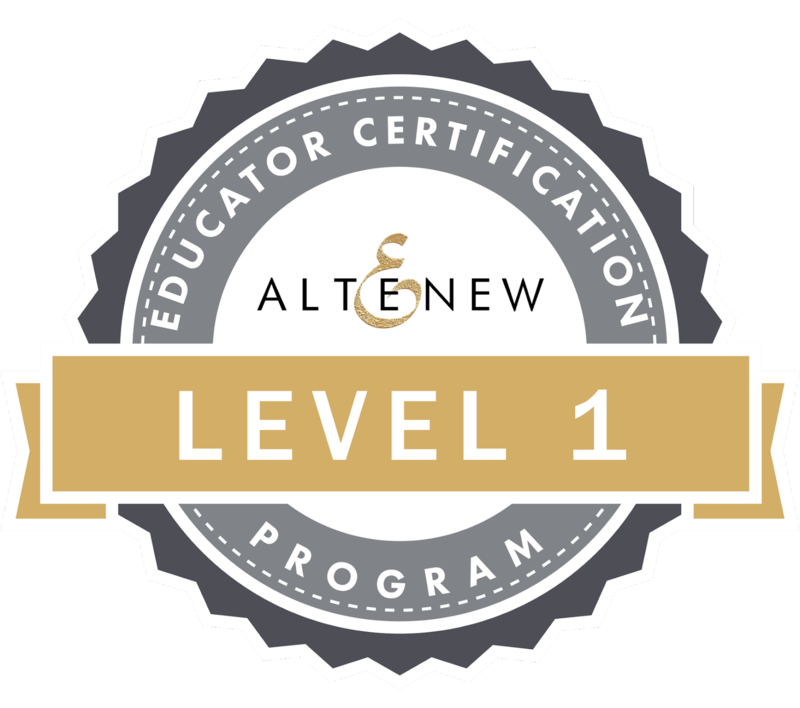 Have you seen the newest badge on my blog??? 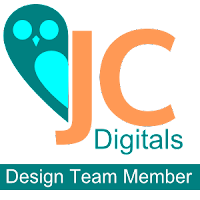 I was selected to be a member of the first design team for Jess Crafts Digitals!!! I've admired Jess's digital stamps on Etsy for a while now. When I saw her Design Team call in December I just knew I had to apply. I'm so thrilled that I was chosen to be a DT member! Jess is working so very hard to design a new digital stamp for her store every Friday. See her blog post here: Jess Crafts Digitals. 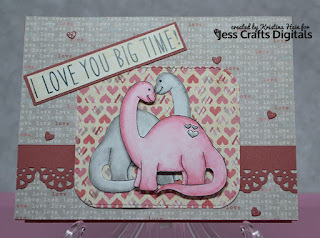 Without further ado, here is my very FIRST project for the Jess Crafts Digitals DT! These super adorable dinosaurs come from her newest release Delightful Dinos Bronty and Bronty with hearts. There are also four great sentiments to choose from. I love that she has included sentiments to use because let's face it, sometimes I just can't come up with a sentiment that fits the image! Jess has eliminated that difficulty! Thank you Jess! I printed the digi's out onto Bristol paper which is my favorite to use when I want to color digis with my Zig Clean Color real brush markers. I wanted them to look like the were cuddling so I made sure to flip the Delightful Dino Bronty the opposite direction before printing. I popped the Bronty with hearts up with foam tape. After I had printed the sentiment out on white paper I decided I didn't like the white with the other patterned paper. So I grabbed a Copic marker and colored it to match the cream of the heart paper. Problem solved! I used a black Sakura glaze pen to make the eyes stand out more. 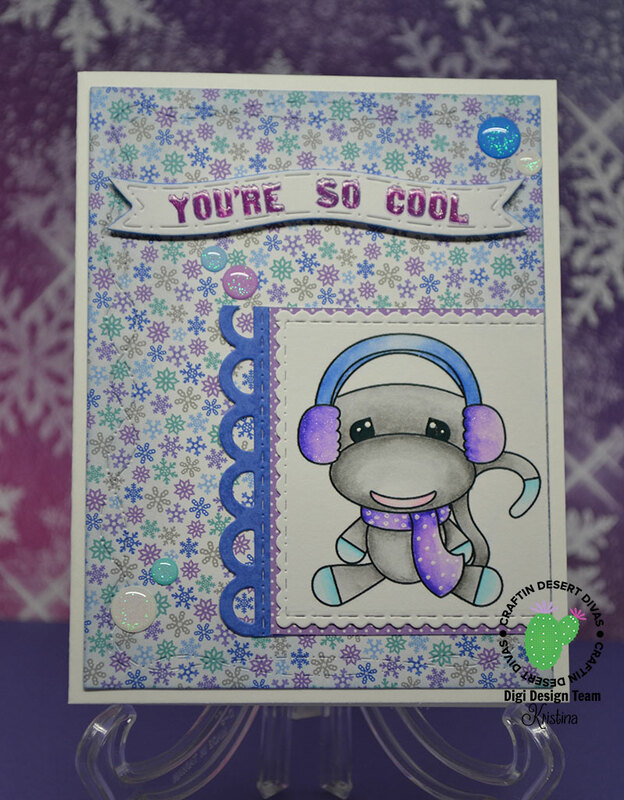 I used a Spectrum Noir sparkle marker on the little red cardstock hearts I scattered around the background. I also added it to the hearts on the girl bronty. On top of the grey hearts I added glossy accents for that something extra. I can't wait to share my next project with you! 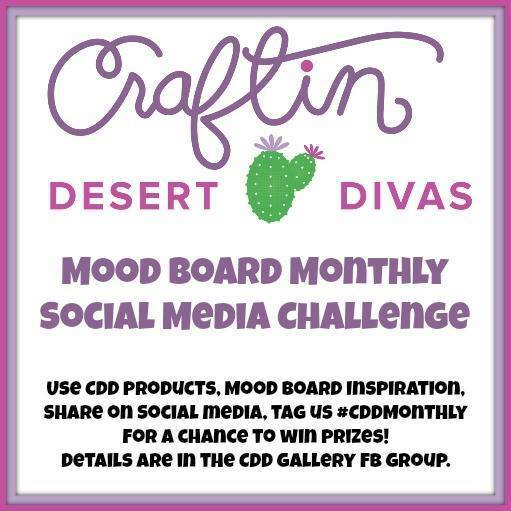 I have to say that I simply adore the current inspiration for Craftin Desert Diva's Mood Board for the Social media challenge this month. Just look at this gorgeousness! If you haven't figured it out by now, my favorite color is purple. Putting purple AND blue together on a project = even more awesome! My project started out small and by the end I had used a whole heap of CDD products! 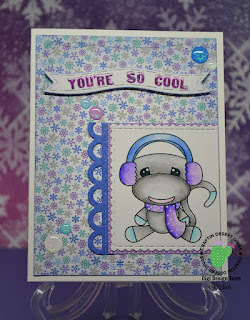 Today's card features an older digi stamp but an absolute cutey! Sock Monkey with Ear Muffs. I printed him out onto Bristol so I could color him with Zig Clean Color real brush markers. I added white dots to his scarf with a white gel pen. I also added it to the white spots on his eyes to make them stand out more. Of course I needed some sparkle so used a Spectrum Noir glitter marker on the ear muffs. The sock monkey layer was cut out using one of the smaller dies from the Fancy Frames set. Even though the die was bigger than I needed it worked out since I wanted to put it right up against the edge of the large back ground paper. I simply cut off the one edge! Next I pulled out a lovely swiss dot purple paper for the next layer. The blue paper is out of the Polar Pals Doodlebug paper pack and I cut it out with a die from the Pocket Pieces Hello set. For the sentiment banner I used curved banner from the Flag Banners set. The sentiment itself comes from the Chilly stamp set. The stamp actually has the words stacked up vertically. I need them to be in a horizontal line. So I grabbed some post-its and masked the other words. Since I wanted the banner to stand out more, I went around the edges very lightly with a blue copic marker and popped it up with foam tape. I added glossy accents very carefully to the words. For the final touch I added an assortment of glitter sprinkles. Don't forget that you have plenty of time to participate in the CDD Monthly challenge. Remember to used #cddmonthly! 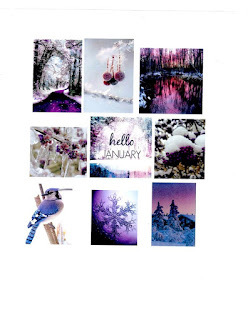 Here we are with a brand new year!! Hard to believe it is here already. So I'm jumping right in as I have the honor of another term on the Craftin Desert Divas digi stamp team!! Woohoo! I have just been having so much fun. Today's project features Java Fox. I know, foxes don't come in blue but hey, it's the crafting world. If I think a fox will look cute in shades of blue then I go for it. You gotta admit he's darling! 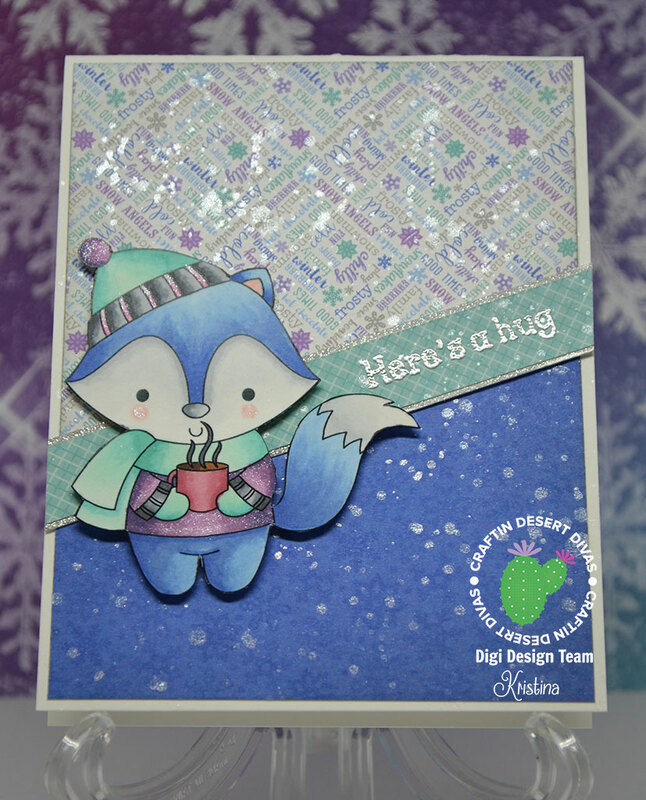 I used the fantastic Polar Pals paper pad (a real favorite) again to help me choose the colors for the fox. 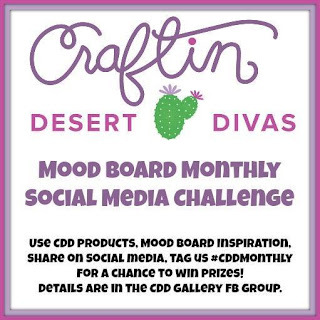 Which just happens to be perfect for this month's Social Media Challenge at Craftin Desert Divas! I colored the fox with several different colors of Copic markers. I used a Spectrum Noir sparkle pen to add sparkle to the sweater, puff ball on the hat and the skinny stripes on the hat. I cut the two patterned papers at an angle and attached to the card base. I cut the aqua strip to fit across the card and embossed the sentiment in silver. Would you believe that the sentiment actually comes from the Autumn Wishes set? I mounted that strip on to a piece of silver glitter cardstock. As I always say, you can never have to much sparkle! I splattered water mixed with Pearl Ex all over the card. As the final touch I used foam tape on the fox in order to give him some extra dimension. I hope you get inspired and consider playing along with the CDD challenge. Don't forget to use #cddmonthly!